Spry Oral Rinse Spearmint gives you fresh breath without the burn! Many mouthwashes rely on a high alcohol content combined with harsh chemicals, leaving the mouth burning. 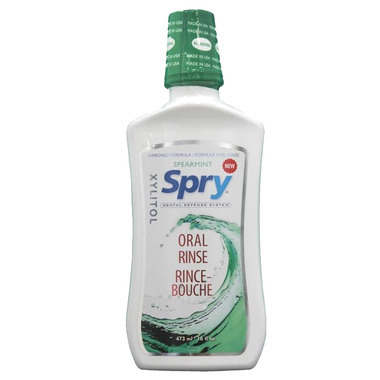 Unlike most common mouthwashes, Spry Oral Rinse boasts a rich supply of xylitol and low alcohol content together with an herbal blend that refreshes the mouth, cleans and protects teeth and soothes irritated oral tissues. Xylitol, a naturally occurring sweetener derived from the fibrous parts of plants. It has a unique molecular structure that affects the ability of bacteria to attach to the surface of teeth and gums. Its pH-neutral formula also helps preserve an environment that controls the negative effects of enamel-eating acid. glycerin (from non-GMO palm fruits), calcium glycerophosphate, aloe vera, marigold flower extract, chamomile flowers extract, Echinacea purpurea extract, olive leaf extract, thyme extract. Best mouthwash that I have tried. The xylitol is supposed to prevent cavities. My mouth stays fresh for several hours. Tastes like natural mint. I LOVE LOVE LOVE this mouthwash! It leaves my breath feeling fresh and best of all it has non toxic ingredients! The new and improved formula is great! I highly recommend it! Works well and tastes great, very minty but not overpowering.